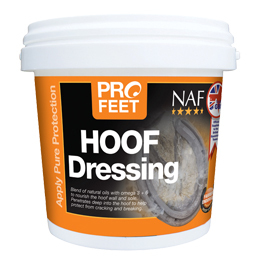 NAF PROFEET Hoof Dressing is a natural ointment which deeply penetrates the horn to keep it supple and protect the hoof from becoming brittle or prone to splitting and cracking. It is a unique hoof ointment which contains extracts of eucalyptus oil. Apply with a sponge and massage thoroughly into the coronary band. For a natural, dressed finish work down and around the outside of the hoof. For animal use only. Replace lid after use. Store in a dry place. NAF recommend a small patch test is carried out prior to initial use. There are currently no questions for NAF PROFEET Hoof Dressing - be the first to ask one!